Oestrus and mating in Angora goats. Many of you would have observed the differences in the oestrus cycle between the Angora goat and sheep ewes. This is a brief overview of the Angora goat ewe oestrus cycle and how it differs to the sheep. Angora ewes natural peak breeding season is April to May but rams can be introduced as early as mid-February. The reproductive efficiency will decline outside the natural peak. Angora ewes cycle every 19-21 days with oestrus lasting 22.3 hours. The Angora ewes do not normally start cycling until stimulated by the presence of a ram and do so rapidly with oestrogen levels increasing after half an hour and heat within 2-3 days. Do not (very few) exhibit silent heat after the ram is introduced. Have more synchronised heat periods after ram introduction than sheep. The ewe cycles again 19-21 days later. –Second Peak 21-24 days after ram introduced. 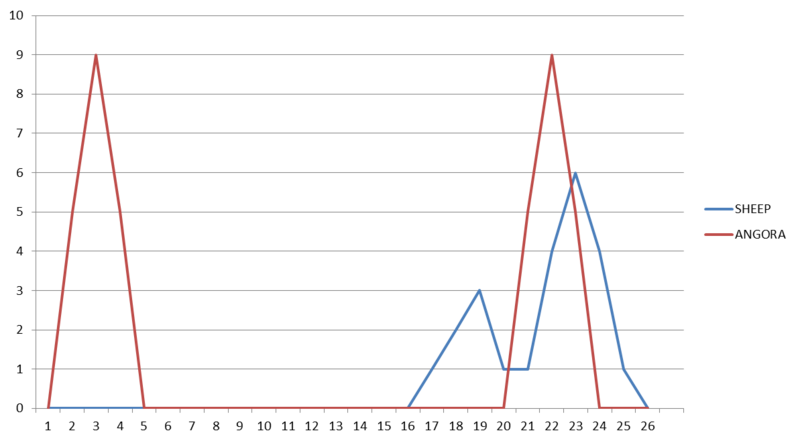 This result in two peaks, the first 2-3 days after the ram is introduced and 21—24 days later (see graph below). The very few angora ewes that do have a silent first heat at 2-3 days cycle again in 5-7 days. They have silent heat within days (2-3) after the rams are introduced – except those ewes already cycling. 30-40% of these ewes ovulate 16-17 days later (18-20 days after ram introduced) – First Peak. The balance of 60-70% of the ewes have a short cycle after the silent heat (4-8 days) and with a second silent heat (with ovulation) then cycle 16-17 days later. (22-24 days after ram introduced) – Second Peak. The natural time for mating Angora goats (autumn) coincides with the time of the year when natural grazing is good and will normally satisfy the feeding needs of the "dry" ewe. For breeding ewes, however, there is sufficient proof that the practice of stimulatory (“flush”) feeding can raise conception figures and the eventual kidding percentage. The relative effect of flush feeding will increase with a decline in the state of the natural grazing. In the case of young two-tooth ewes mated for the first time, the effect of flush feeding will be most dramatic and in this case at least, should always be applied. It is well accepted that ewes under 27-28 kg have poorer kidding percentages. When flush feeding is implemented, it must be started two weeks before the mating season commences, and maintained for at least three weeks during the mating season. After this, the level of supplementation should be reduced gradually until it is discontinued. It is also important to note that flush feeding is more effective when a high level of supplementation is provided for a shorter period as opposed to low level supplementation level over a longer period.